Growing a garden is a great way to spend time connecting with nature and where your food comes from. One of the first things you learn that is that it's not easy! No worries, your friends at Many Feathers have put together an assortment of resources to help, guide, and troubleshoot issues you may be having. Please email maleeha@manyfeathers.ca if an issue you are having is not addressed here. General information our gardeners must know can be found in the Many Feathers Garden Handbook. The following section will help you answer how to water your plot. The garden is located in full sun so it will need your attention on bouts of dry and hot days. Watering may be easier done with 2 or more group members. There are two methods for watering, through our rain barrels, or through the hose. You should use the rain barrels first if they have water in them, and use the hose for dry spells. We have multiple rain barrels on site to help us conserve water. These are accessible through filling a watering can with water and watering directly to areas that need it. The watering cans are located in the shed and must be put back there after each use. The hose will be located at the side of the garden, and should be kept coiled. Uncoil the hose in sections and bring it towards the tap. Don’t drag the hose by the end, grab a section of the hose and drag it out. Be careful that it does not go over other plots' plants. The tap will be unlocked during the season, so after attaching the hose you can water your plot. When your watering is complete, return the hose one section at a time to the hose reel. Make sure to turn off the water after each use. Never leave the hose attached to the tap unless you are watering, because cars drive in that area and may damage the hose! Notify the Community Garden staff immediately if there is a problem with the water supply or hose. The amount of watering depends on the weather and plant. For example, if we are having a very hot and dry spring and summer, then you may need to water daily. Most plants have instructions on how much water they require. Keep an eye on the weather and adjust your watering appropriately. For example, if the day’s forecast indicates that rain is coming, you may be able to skip watering that day. However, always check that it actually rained and that your plants received sufficient water, rather than relying on nature. The following blog post offers more advice on the topic. We recommend you use the rain gauge to determine how much rainfall has actually hit the garden. This will be located at the Kid's Garden with a sign to let you know where to check! 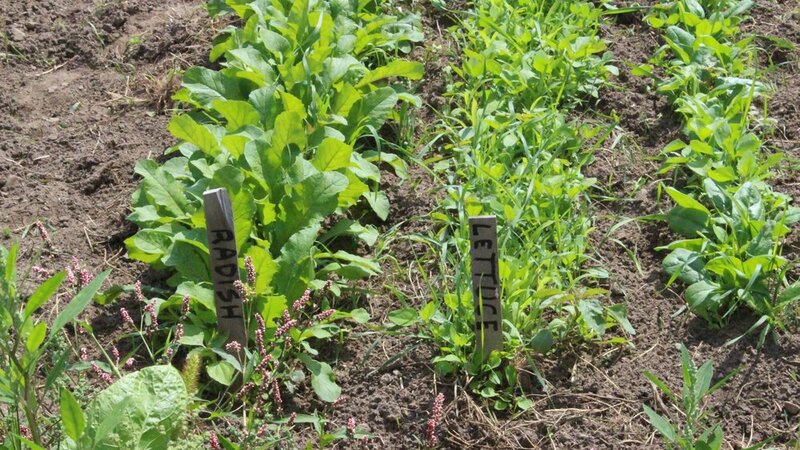 This section will help you identify weeds in the garden, and how to manage them effectively. In 2017 Many Feathers Garden Supervisor, Nick Kozole and Garden Manager, Maleeha Farooq created a Weed Manual specifically for the community garden, researching and identifying weeds that were present. Mulch the area around your plants, we recommend taking a trip to Monaghan Mushrooms (7345 Guelph Line, Campbellville, ON) to pick up free mushroom mulch. Take a shovel and a few bins with you! Do not use any chemical weed killers in or around our garden. Do not use any chemical pesticides in or around our garden. Very affordable compost is available from the Battleford Community Recycling Centre, you need to take bins to transport it as it is sold loose. After you have harvested you can use the following link to determine how to store what you have grown. In addition, you can always donate produce to the Many Feathers Food Donation Program that gives back to food banks and community kitchen. These donations can be dropped of at the Sunday farmers' market between the hours of 9-2PM at Lisgar Go Station. Email maleeha@manyfeathers.ca if you have any questions about how to share your harvest.